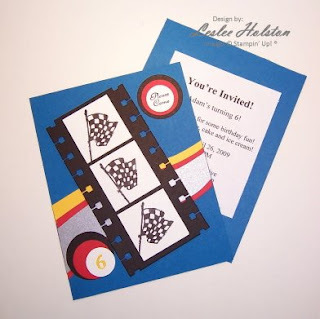 Leslee's Creative Inspiration: The Race Is On!!! Wow! I'm so sorry that it has been five days since my last post. There's been so much going on here at the Holston household. It usually gets crazy around here mid-April. There's lots of deadlines to meet. One of the biggest (and highly important) is Adam's birthday party! My baby is turning six! Of course, we always throw him a party and I always make his invitations. This year was no different...other than I had only two days to make them. That's right....the race is on! Of course, he wants a 'race car' party. 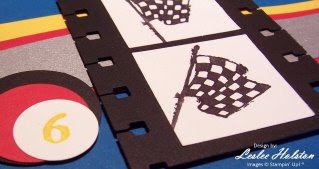 My one and only set containing a race car is Stampin' Up! 's retired "To The Finish". The thought of coloring a dozen of those cars in less than two days didn't thrill me at all. So, this is what I came up with. I hope you've been inspired. Don't let the race to the finish overwhelm you. It's usually the journey between the start/finish that's the most fun!